Commercial fridge units are no doubt the sturdy applications, but there comes a time when the strongest application fails due to lack of maintenance. Hence, commercial refrigeration maintenance is necessary to extend the lifespan of your refrigeration equipment. So, when was the last time you serviced your commercial cooling equipment? Is there any schedule for maintenance programme? 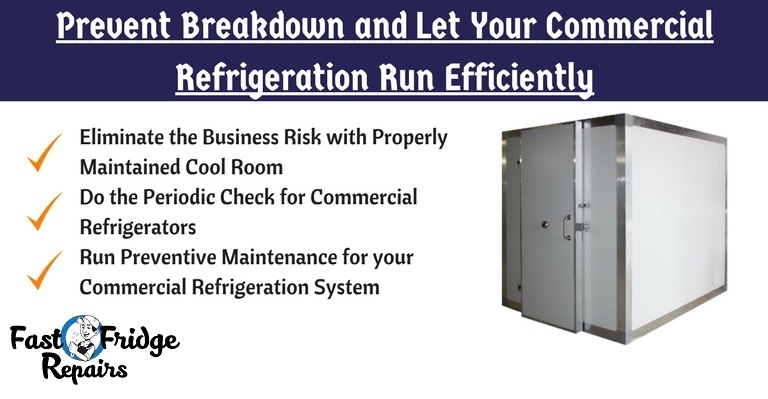 Here are the following points that highlight the importance of commercial refrigeration maintenance. See some outlined tips also to maintain your equipment. How Does the Refrigeration Problem Arise? Whether you know or not, commercial refrigeration maintenance is critical, especially when it comes to cool room maintenance and installation in Sydney. Well, refrigeration equipment expels the heat, and most of the cooling unit does this through the condenser coil. During the cooling process, the cool air is drawn inside through the coil, which causes the debris accumulation on the condenser coil. So, over the time, if you fail to clean condenser on a regular basis, it will increase the electrical consumption that eventually leads to system failure. So, what are the problems basically? Do you know you will end up losing your stock if you face the sudden breakdown of your cool room or other refrigeration system? So, the smartest thing you could do to your cool room is looking after it periodically to find whether they run efficiently or not. If your business relies on food processing and preserving, you have to schedule regular maintenance programs for your cool room. There is a certain span, beyond which the refrigerated food can’t last without required temperature and hence grow bacteria thereafter. More the food spoils, greater the business risk! So, what’s the solution then? Clean the Walls Regularly: Just a damp cloth and mild detergent are enough to clean the walls. Upon appointing professionals, your cool room walls will get better treatment. For example, they use safe products, especially aware of the chemicals that can damage your cool room. If you find any stains appearing after basic cleaning, professionals may help you in that. Keep the Seal Cleaned: Damage seal can affect the performance of your refrigerator. Avoid using heavy-duty cleaners that can damage your seal. Generally, warm water be will be enough to clean, but in case there is enough grim or dirt, you can take help of professionals, who use safe cleaning products to keep cold room’s efficiency intact. Always keep checking whether your refrigeration unit is working too hard to keep the system cool. Properly Install the Gasket: The warm air will seep in through the split gaskets that can result in damage to the food or other perishable products easily. So, keeping gasket clean and properly installed for proper cooling. Keep the Drain Clear: In case any drain line outlets are found visible, clear out the drain and ensure the lines of your freezer should remain clean and free of any debris. Professionals come with all relevant commercial refrigeration repair and maintenance skills for an error-free refrigeration system. Lastly, you should put more focus on running preventive maintenance for your commercial refrigeration system since the beginning. Keep the drains, condenser coil clean, check the coil motors, unit compressor, refrigerant level, and check the temperature as well for top-notch performance. A professional for refrigeration maintenance will let you appoint the qualified engineers to test the all major components of the cooling system.